These buys will be executing Tuesday morning. I have in the last month been trying to reduce my cash positions since my cash weightings have been continuously rising as my paychecks come in. My purchases in the coming weeks will most likely be less and will be more in line with whatever remaining money from my regular paycheck I allocate for investing. Although $10k is a lot of cash, my cash reserves are replenished rather quickly as long as I continue having my daily job. Since my cost of living is a small percentage of my take home income and my debt to income ratio is basically 0, I have large flows of money I can deploy every month to my investments. Edit: Account didn't have enough funds to execute the Clorox buy. As a note, I pay $1 per buy transaction on Tuesday morning using Capital One Investing. The buys are only executed on Tuesday. So out of $10,000 I pay $6 which is a 0.06% fee. The buys are executed together in bulk with other people's orders. I find that my orders are bought around 11am Pacific Time so the price at that time is whatever I get. To sell, I will have to pay $6.95 and I can define my limit order and when I want it to be sold. If I want to buy on my own desired time I will have to pay $6.95 per transaction. Although the commission is cheap I find the lack of control such as setting limit buy prices and deciding when to buy a bit problematic. I have no plan to change brokerages though at the moment since I like the pricing. I only use Capital One Investing on my taxable account. My 401k is with my employer's provider and my Roth IRA is with Fidelity. My heaviest weights as of July 2016 is in Staples. This is more than I want to be honest and I'm grateful that Staples have performed very well due to the flight to yield recently. I want to increase my weightings in more non-cyclical sectors besides Staples. I largely favor companies that are recession resistant and provide consistent earnings and revenues. These companies are usually Staples, Utilities, and Healthcare companies. I am not against Industrials, Discretionary, Materials, or Energy and I am willing to add to those sectors to diversify. However I will always prioritize consistent companies over cyclical ones and I will always demand cyclical companies to sell at a larger discount before executing buys on them. My main goal is income generation and income preservation, and changes in the economy on cyclical sectors' earnings are the highest risk to that objective. This week's buys will be a rather diverse spread with some additional emphasis on Utilities. I admit Utilities are expensive right now but I believe my purchases will generate sizable returns if one has a 30 year time window and not just a 1 to 5 year window. If the Utilities drop (flight away from yield or rise in interest rates), I will easily just add more and cost average down using my biweekly paycheck. A few thousands today is a very small percentage of what I plan my portfolio will be in 5-6 years, which s $1 Million dollars. I rather have my money work right now instead of me betting on timing the market correctly. I do feel that interest rates will remain low for a long time. I also feel that foreign countries will continue to devalue their currencies and negative yield government bonds will continue to be a thing (Germany, Swiss, and Japan are all negative now). Negative government bonds in foreign countries will cause foreign investors to put their money in US treasuries (we're still positive!) causing our yields to decrease even further. Lower yields cause high yielding high quality companies (think JNJ, CLX, MO, reits, utilities, and the likes) to rise in value even more. We are in a period today that cannot be compared with our economy's past. Extremely low yields are impacting how we should be valuing our companies, especially those with higher dividends, since those companies with high quality earnings and balance sheets will be increasingly sought after by retirees and foreign investors. Governments that continue to deploy monetary policies that increase money supply to stimulate the economy such as Japan and Europe will cause foreign investors to plow more and more money into US assets. US assets are seen as higher quality and safer than foreign assets, especially after Brexit. US assets can include housing and stocks and bonds. The more buyers there are for US assets, the more expensive they get. And we are seeing some of that right now especially with higher yielding assets. UTX, and MDT I find as fair value buys at this level. S&P analysts agree with that as well. FastGraphs indicates these companies are fair value. 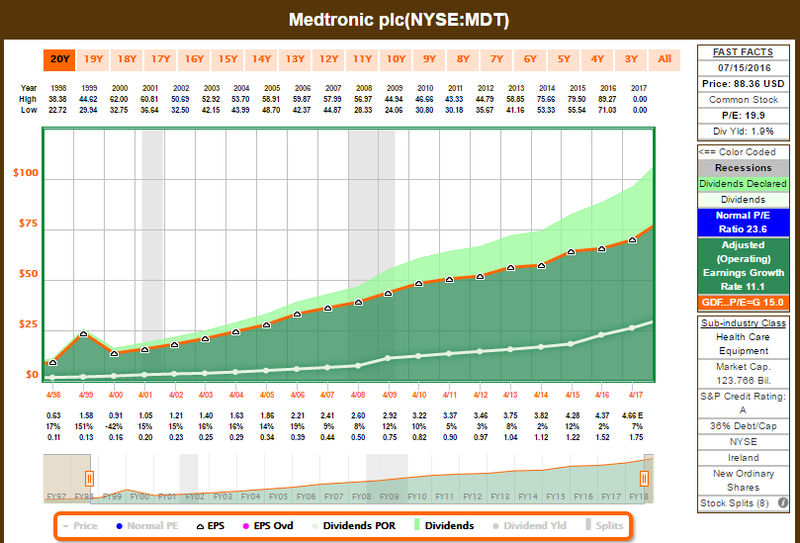 MDT (a healthcare devices company) is undergoing PE expansion compared to its historical past. Since the recession, MDT has had a much lower PE than it usually has had in the past. MDT has very consistent earnings and dividend growth and is recession resistant. 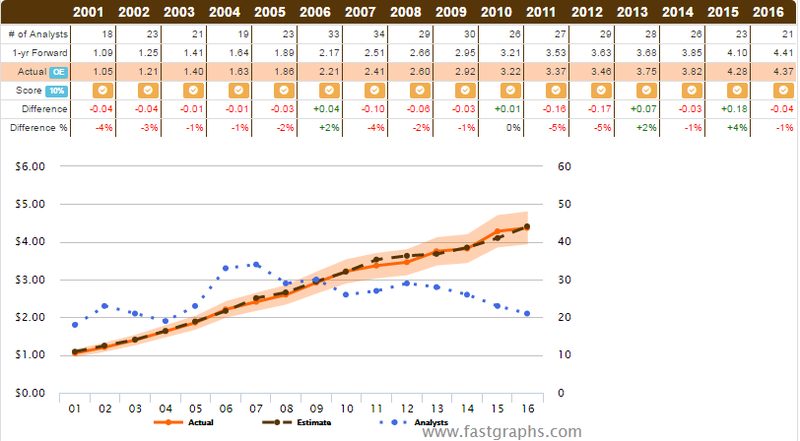 The graphs below show that MDT's earnings (orange) and dividends (white) are recession resistant and very predictable. The second graph below shows that analysts have been able to predict MDT's earnings very accurately. It also indicates MDT's earnings are consistently increasing which is my type of business! 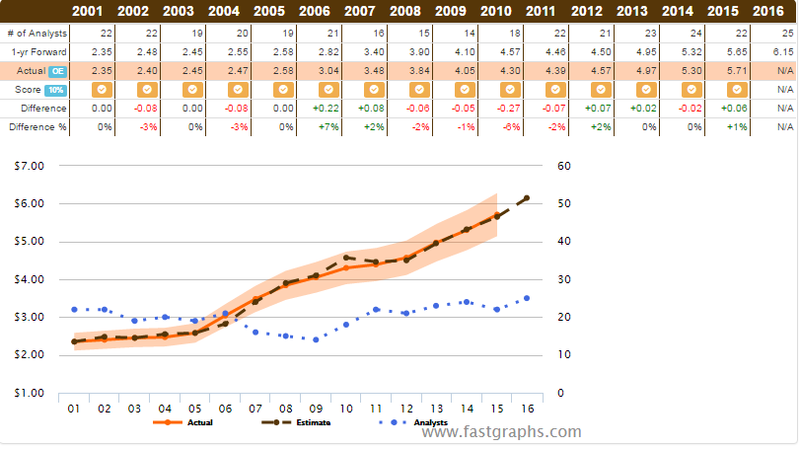 XEL and MCD are around 10% overvalued. The blue shows earnings and the white are dividends. It is extremely consistent and it grows much faster than usual utilities like SO or ED. Since it's growing faster, it usually has a lower dividend compared to its peers. Additionally, the chart above shows that NEE is highly predictable. Analysts have always been able to predict the earnings with high accuracy. 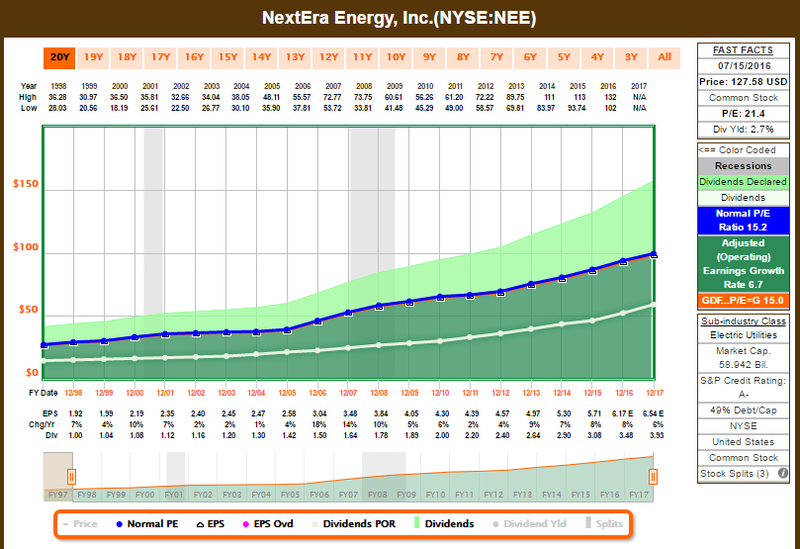 In other words, NEE has consistent earnings growth, recession resistant, and high predictability. This is my best of business. For more of my favorite types of businesses with solid consistency you can look at my "Tier 1 Stocks" page.